Colorful animals teach counting numbers from one to ten through simple pop-ups. Vibrant mixed-media illustrations (3-5). 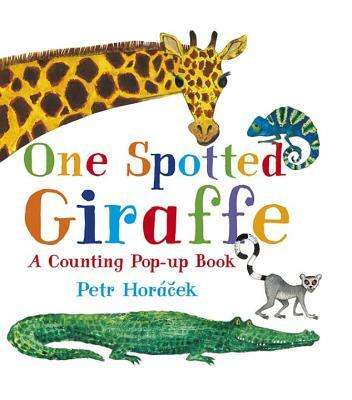 Count from one spotted giraffe to ten darting fish in this perky pop-up book from renowned illustrator Petr Horacek. Very young children can identify animals, count them, and discover numerals in this stand-out selection. Spreads filled with realistic depictions of colorful creatures everything from pandas to lemurs entice readers to count the animals, then flip the flap to reveal a corresponding pop-up numeral. And then the surprise: the numeral looks just like the animal fur, spots, stripes, and all Toddlers and preschoolers will delight in this bold, innovative concept book, a fantastic tool for making numbers noticeable for little learners. Petr Horacek grew up in Prague in the Czech Republic. Inspired by his two daughters, he has created numerous books for children, including "Silly Suzy Goose "and "Strawberries Are Red." He lives in England." Horacek's paintings brim with personality.